Cilantro. My favorite herb/garnish/breath freshner. It is without a doubt the best herb on the planet. Think I’m joking? I’m not. And neither are these guys. But rather than go on about how wonderful cilantro is, I’m just going to get to the submissions so you can experience the awesomeness for yourselves. 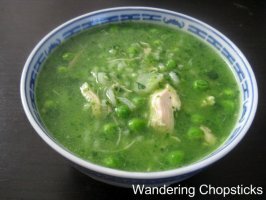 Aguadito de Pollo (Peruvian Chicken Soup) submitted by Wandering Chopsticks. Most soups are cold-weather food to me, but cilantro adds so much bright, fresh flavor, I bet this soup is perfect even on the warmest days. The vibrant green color even reminds me of warm weather! 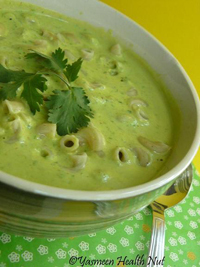 Cilantro-coconut milk pasta submitted by Yasmeen of Health Nut. A twist on the typical creamy pasta sauce, using instead coconut milk and a generous dose of cilantro. Thai prawn toasts with coriander submitted by Erbe in Cucina. This is one of my favorite snacks due to the taste and texture. Nothing beats the flavor of prawns and cilantro in a crispy yet chewy package. Cilantro Horchata from the [eatingclub]vancouver. Okay, I find this intriguing. 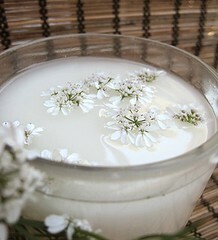 Horchata made with a cilantro infused simple syrup. Sounds different enough that I want to try it. 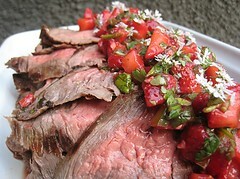 Strawberry cilantro salsa on grilled flank steak also submitted by [eatingclub]vancouver. First the cilantro horchata, now strawberries and cilantro. Is there nothing cilantro doesn’t go with? 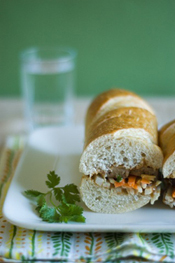 Vietnamese Tofu Sandwich submitted by Pink Bites. Like Vietnamese summer rolls, but on a bun with a peanut butter-hoisin-mayo spread, fresh vegetables and a healthy sprinkling of cilantro leaves. Sounds like perfect summer food! 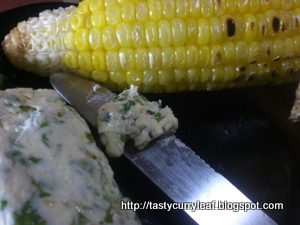 Grilled corn with spicy cilantro butter submitted by TastyCurryLeaf. Speaks for itself; simple but delicious. Cilantro shrimp Chinese dumplings submitted by Javaholic. 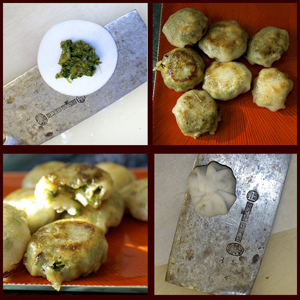 These dumplings were made from scratch, including the wrappers! FROM. SCRATCH. And there’s cilantro. Awesomeness. 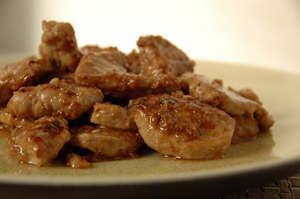 Garlicky Pork Stir-fry submitted by me. Easy and family-friendly stir-fry flavored with a paste made of cilantro roots, white peppercorns, and garlic in a soy-based sauce. Thanks to everyone who participated in the cilantro challenge! The next theme ingredient will be cheese! Wonderful, glorious cheese! Any kind of cheese you want! The host will be Yasmeen of Health Nut. Please send submissions to yasmeenhealthnut(at)gmail(dot)com by 11:59 PM, Sunday, August 2nd. I found you through Mary and One Perfect Bite. I love your blog and your content. And I'm Thai so I love all of your Asian yummies. I wish I participated in your cilantro challenge. I have a ton of recipes for cilantro. However I'm going to make your cheese challenge for sure! I'll definitely be back. You seem like a girl after my own heart! Yasmeen, thank you for participating! Puna, I'm glad you stopped by and thanks so much for your kind words! 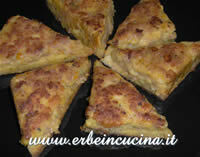 I hope you will participate in the cheese challenge. Lovely Cilantro Dishes and delicious round up.Happy to be a part of WW. I find people are at either extreme with cilantro - absolute abhorrence, or complete and utter love. I looooooooove cilantro, and can never get enough. I always ask for "extra cilantro" with everything. I think in order for my taste buds to detect it, I need large quantities. Yum. Wonderful roundup, all of the dishes look and sound terrific. Cilantro is such a versatile herb from seed to root. Cilantro horchata sounds cooling, and your crispy pork looks like it would be the perfect dish to eat with it. Thanks again for doing the roundup. What a great round-up, dp. I'm a huge cilantro fan and there are several things here that caught my eye. Now to find some time! Although thankfully it does grow very well indoors. We have to convert these cilantro haters: thanks for hosting and for a great round-up! I'm drooling over the prawn toasts. Cilantro is one of our favorites as well. It's so versatile and refreshing! Check our Twitter feed--we're excited to share all these wonderful ideas for using Cilantro with our followers!